Clean, cozy house with gorgeous natural light in the gated Seadrift community. Manmade lagoon for swimming and boating on one side, Bolinas estuary filled with ongoing parade of egrets, pelicans and herons on the other. Easy walk to the beach and tennis courts. A perfect area for kids to run, bike or skate freely. Cable TV, ROKU, and a DVD player and, better yet, lots of books and games, a Bose CD player with iPod capability, an eclectic assortment of CDs, and many comfy chairs for reading and dozing. Sunny, warm deck with huge hot tub and view of Marin hills, well protected from wind and fog. Several canoes and/or kayaks get you on the water. Wireless internet access for those who can't leave work behind. Bikes available for use, as well as sand toys and life preservers. Newly renovated third room with full sized bed, tv and window seat - a perfect place for some to hang out watching a movie or sports while others relax in the living room by the fire. Spectacular hiking and bird-watching are nearby, and the gentle waves at north end of the beach offer one of the best beginning surfing spots in California. There are a couple of good beach snack shops - the Parkside and the Siren Canteen. Sweet little town of Stinson Beach has several really cute shops, an excellent bookstore, three restaurants, and a wonderful library, outdoor theater, community center, and market. Gorgeous green Marin hills seen from living room windows and from most places in the house. 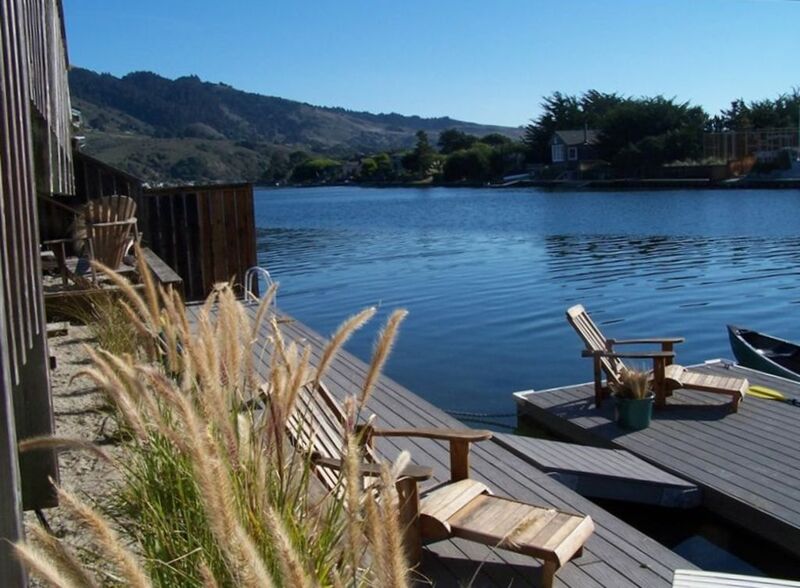 On one side of the house is the Bolinas Estuary; on the other is the tidal Seadrift Lagoon. Birds birds birds. Calm view from the street side deck. Perfect for evening bird viewing. Landline for local calls only. Also is used to let people in the gate when they come after the guard has left. Phone will ring, you answer, your friend says hello, and you push 9. Please don't use more than absolutely necessary. A real need to conserve water in this area. Try to fit all cars in the driveway so that you have a lovely view when sitting on the street side deck in the evening. View is lovely and you can see more if there isn't a car in the street. Bikes and other supplies make it difficult to park in the garage. French door LTG fridge with freezer drawer below. Fully stocked with plates, cups, bowls, glasses, etc. Nice dining room table with six matching chairs. Other chairs around game table can be used for more people. Cable, ROKU, DVD player. You must change the Input button to access each of these options. Lots and lots of childrens' books, as well as a great adult selection as well. Some blocks and fun things for little kids. Please return kayaks to the platform on side of house and paddles to the hooks on fence there. My neighbor is sensitive to noise and it really carries on the water. So please observe the 10 pm curfew. No loud noise or talking in hot tub after that time. Courts at north end of Seadrift Road. Oh my gosh, the bird viewing is incredible. And the relaxation potential is unparalleled. You will arrive one person and leave another. Walk, get on the water, swim, sit and just look at the view, read, cook, talk, play games with the family. You will love it, I guarantee. We had a lovely stay in this home. It was my husbands birthday and it was the perfect place to relax with our 5 month old baby. The house is well looked after and totally stock with everything one would need. Looking forward to staying here again soon. Thank you for letting us share your beautiful home! We kayaked, used the red canoe, rode our bikes around the lagoon, looked for shells at the beach, built sand castles, cooked delicious meals and sat in the hot tub. Beds were very comfortable and we had everything that we needed. Hope to come back soon! We loved this house! We've stayed in Seadrift quite a few times and always loved our times there, liking some houses more than others. Megan's house is easily the best place we've stayed - lovely views on both sides through the huge windows (with high ceilings, the floor to ceiling windows are even more wonderful), an ideal layout, beautiful yet comfortable furnishings, a kitchen equipped with everything you need for cooking and eating (and then some! ), comfortable and well-decorated bedrooms with ample and great quality bedding, a hot tub, a lovely deck on the water (enclosed - great for our dog and would be great for young children), boats and more to take out on the canal...Really, this house has everything! We had an amazing, relaxing, and restorative long weekend, even with heavy rain for 4 of our 5 days keeping us inside a lot. This actually allowed us to enjoy the house even more with a cozy fire, lots of board game action from the selection (family Scrabble and dominoes were our favorite! ), lots and lots of reading on the terrific and lounge-able couches and oversized chairs, and watching a couple of movies on the big, flat screen TV in the lower room (lots of choices through Netflix, then Megan's great DVD collection!). Really, I can't recommend this house enough! Megan was extremely responsive and helpful as we were settling in (even getting the heat going remotely before we arrived via Nest) and when I had a quick question, and the house was in excellent shape when we arrived (with fresh flowers on the kitchen table - so lovely!). Thank you, Megan, for allowing us to use your lovely home. We can't wait to come back! Upon entering Megan's house it feels like you're home! The house is full of light and warmth, from the cozy wood fireplace to the colorful artwork throughout the house. The kitchen is fully stocked with all the utensils and place settings you could want. The beach is within walking distance, and the lagoon is just outside the door. This vacation did not disappoint at all. I have stayed all over point Reyes and Stinson beach and this was the loveliest place of all. With beautiful views on both sides of the home we really could not have asked for more. Lovely furnishing . The owner was very kind and helpful. Can’t wait to go back. Best bread and pesto and pizza at Parkside Grill store in back.